If you’re travelling from Queenstown to Milford Sound, you may look as though you’re travelling in a straight line. It may appear that way on the map – but don’t be fooled. The roads here are windy and many go uphill. If you’re travelling in a bus or rental car, you’ll have to allow about 10 hours drive time for a 600 kms return trip! This is the reason why a lot of travellers choose the fly-cruise-fly option with a trusted local operators such as Real Journeys. From Queenstown, the return trip takes about 4.5 hours, so it makes sense to start in the morning. That way, you’ll be back in Queenstown around lunchtime. The flight part of the trip passes over some of the most stunning scenery in New Zealand. So from that point of view alone, it’s worth it. The key challenge with all flight options ex Queenstown is the changeable weather. Conditions such as as fog, heavy rain or strong winds,can prevent the flight at any stage of the journey. Generally, the flight operators expect passengers to check weather conditions on the morning of departure. By the way, Queenstown can be totally different to the weather in Milford Sound. It’s all due to the Southern Alps running between Milford and Queenstown. Once you’ve landed at Milford Sound Air Field you’ll be transferred to the wharf terminal for a 2-hour boat. A great option is the Milford Mariner, a nature cruise we recommend because of its smaller passenger numbers – plus there’s a wildlife guide on-board. Now for an added level of excitement, a helicopter is an even better flight option. 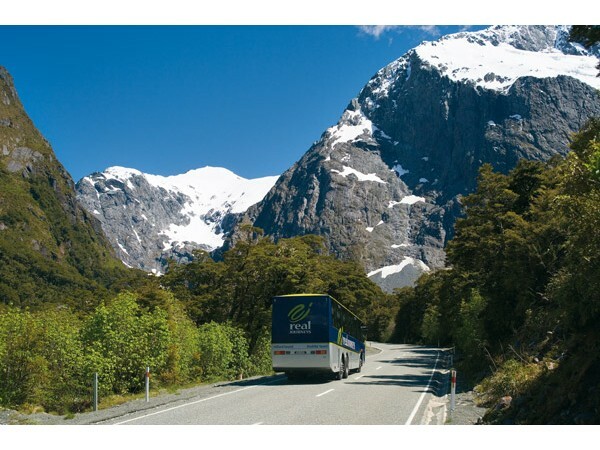 Coach–cruise–fly will offer you the best of both worlds:- First up, you’ll get a flight into Milford and back via the Fiordland National Park road. This is regarded as one of the must stunning scenic drives on planet earth! But be prepared for a full day. It includes a 5-6 hour journey by coach from Queenstown to Milford Sound – with stops in between. After the cruise you’ll fly back. If the weather conditions deteriorate during the day, the operator will provide a full a coach trip all the way back to Queenstown. This option is the least costly, but the most time-consuming as far as a day trip between Queenstown and Milford Sound goes. You’ll be on the road (and the cruise boat) for 12 hours. It’s a very long day. The advantage with the coach option is that you can kick back and enjoy a great local commentary by a driver-guide. Plus you’ll get some stunning views – the seats and windows of the bus are specifically designed to make the ride really enjoyable. There are toilet and scenic stops on the way. On these stops you’ll get to breathe pure oxygen, touch the wet moss, walk past waterfalls and see those cheeky kea birds! A word of caution – not all operators are created equal – choose a reliable local operator with modern coaches and prompt service. 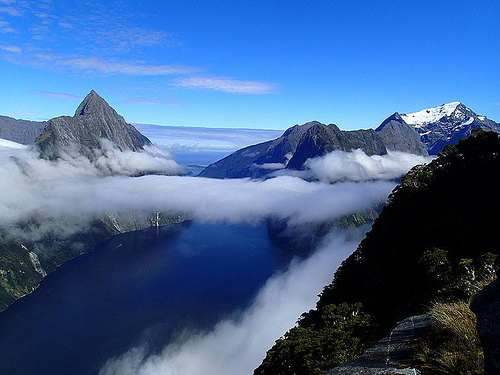 You can also do a day tour to Milford Sound in your own rental car. But do keep in mind that this is a 600 kms drive. In New Zealand, this is a big deal – we don’t have German autobahns. In the Fiordland region you need to calculate on 60km per hour, so 600 kms will take about 10 hours driving (not including scenic stops and walks etc.) For some less experienced drivers we definitely recommend the coach option as there is also a long tunnel (the Homer Tunnel) just before you reach Milford Sound. This can be quite daunting if you’re self-driving. If you really want to do things differently, consider the Milford Sound Overnight Cruise, departing late afternoon from Milford Sound Wharf. And if you have enough time to travel from Queenstown to Milford, do some walks in between and board the vessel around 4pm. There is plenty of car parking as well. Talk a small bag for the night and for goodness sake, don’t forget your rain jacket!. Dinner and breakfast is provided on-board. You can also choose your own cabin with ensuite bathroom. There are also some bunks with shared bathroom facilities. Obviously, this is less costly, but boy, is it noisy! After breakfast, you return to the wharf and off you go to new adventures! You can also combine the Overnighter with a flight from Queenstown (subject to weather conditions). My recommendation: if you prefer a more quiet, leisurely accommodation experience go for the Milford Mariner ship. If you’re young and out there for party time, choose the Milford Wanderer (which has mostly bunks to suit those on a more limited budget.) Another overnight option is Doubtful Sound. Personally, I prefer this option as it allows more time for the Te Anau + Fiordland area. Stay for a couple of nights in Te Anau and make this your base. The small Te Anau village it’s more the “true New Zealand”. It has a lovely lake fronting your doorstep and the Te Anau Caves nearby with stunning short walks, such as the Rainbow Reach/ Kepler Track on which parts of the Lord of the Rings were filmed. You may also want to consider going to Doubtful Sound instead. 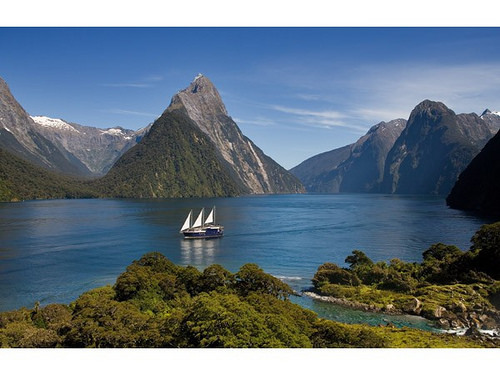 Drive yourself into Milford Sound, do the cruise (again I’d recommend the “Nature Cruise”). Give yourself plenty of time for walks, photo stops and maybe just a little detour into the Hollyford Valley. Lake Marian is a gorgeous walk and further down a Kiwi-classic “Gunn’s Camp”. If you’re sick of driving, join a day tour with a good local operator such as “Trips and Tramps”. These guys “really know their stuff” and will get you to the right places at the right time! Talking about timing, here’s one little piece of advice: If you’re travelling with your rental car, avoid starting between 8-10am. Everyone will be on the road then. Instead, travel at 7am or after 10am and you’ll get the road almost to yourself. Whatever you choose, you’ll get to enjoy one of the most beautiful and remote scenic spots on planet Earth – guaranteed! Thanks Tim. We too like hearing about the all important details and of to know there’s often more than one option to suit. Excellent content! I have also compiled a list of great stops along the road from Queenstown to Milford Sound. I definitely agree that staying in Te Anau is the best option! It gives you far more time to explore Milford Sound. I loved my trip between Te Anau and Milford Sound, Fiordland is such a beautiful area of New Zealand. Thanks for your comments Mark. Always good to hear the enthusiasm of other travellers. Glad you enjoyed this special scenic trip between Te Anau and Fiordland.